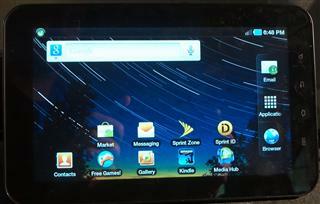 The Samsung Galaxy Tab is a 7" tablet running Android 2.2 (Froyo). There are different models produced by wireless carriers, including Sprint and Verizon. You can purchase these devices without a contract but you will pay a premium. That's enough of the small talk, lets get to rooting. Previously, there was an app called z4root that would allow you to root the Galaxy Tab. Although z4root was removed from the Android Market, you can still find it hidden away on the Internet. In my testing, I could no longer make it work with the Sprint Galaxy Tab. So what do you do? Follow the directions below and you will have root in just a few minutes. I am using the Sprint version of the Galaxy Tab for this demonstration. These directions should work with other models but proceed with caution. Standard disclaimer time! Rooting your device may be dangerous to the health of your Galaxy Tab. You are taking advantage of a vulnerability to gain elevated privileges on your device. If you are uncertain of what this means, do not proceed. I have tested this on the Sprint Galaxy Tab and been successful. That does not mean it will work for you! If you do proceed and you break your device, do not email me. You have been warned! So, I guess you have decided to proceed. On the back of your Galaxy Tab, find the model. Mine is an SPH-P100. To get the drivers, go to http://www.samsung.com/us/support/. Download and install the appropriate driver package on your Windows computer. While you have your browser warm, head over to the xda-developers forum site and download SuperOneClick. Here's a direct link to the forum topic, http://forum.xda-developers.com/showthread.php?t=803682. Download the file named SuperOneClickv1.7-ShortFuse.zip and extract it to your desktop. Before you connect the USB cable, power on your Galaxy Tab. Go to Settings->Applications->Development and enable USB debugging. If you have connected the USB cable you will not be able to enable or disable USB debugging until you unplug the cable. After you have enabled USB debugging, go ahead and plug in the USB cable to the tablet and the computer. Now, we are ready to do the magic. Go to the SuperOneClick folder on your desktop and start SuperOneClick.exe. See the little shield icon? That means you have to run it with admin priveleges. Double click it and enter your admin credentials. Look for the Root button, it should be easy to find! Click the Root button and wait. Some messages will scroll across the screen. Hopefully, you will be prompted that the rooting was successful. Click yes to test and install the Superuser application. You will probably have to reboot the device before you will be able to get root. Disconnect the USB cable and reboot now. That's it! Your device is rooted. You can test this by starting Android Terminal Emulator (install it from the Market if you don't have it). From the $ prompt, type su and hit enter. Superuser should prompt you to Allow this action. Choose to Allow and you will get a root (#) prompt! You are now root, so be careful what you type! SuperOneClick essentially freezes completely ... have to Use Task Manager to shut it down.